Image showing the Slooh iPad app. A new iPad app allows anyone around the world to take telescope photos of celestial objects from the comfort of a couch. The online Slooh Space Camera — an organization that hosts live views and webcasts of cosmic sights from a network of international telescopes — has created an app that allows users to command and control their robotic network of space cameras. Space fans that download the app can "command a mission" to any object they find on a sky chart. Slooh's professional telescopes will take a photo of the cosmic sight, providing the user with a time, date and observatory-stamped image that will be loaded into the digital skywatcher's personal app. "Much of the fun will be in 'filling out' your own sky to build your collection, in the app," Slooh president Patrick Paolucci said in a statement. "It starts out blank until you command a Slooh Space Camera. It’s truly your own image, not a photo taken months or years earlier by some unknown facility or astro geek." Slooh's iPad app is free to download, but commanding a mission costs $1.99 or more. 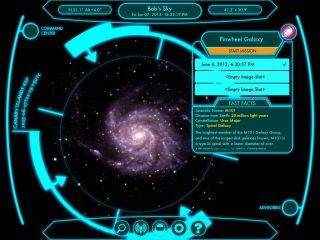 The app also contains information about the various celestial objects that users can investigate on the interactive sky chart. iPad users can also watch Slooh's live webcasts featuring live space views and expert commentary. Slooh's new iPad app shows an annular eclipse. "It's just too inconvenient for the vast majority of individuals to use a retail telescope without some sort of hands on guidance — not to mention the difficulties with weather, light pollution, poor imaging and timing," Bob Berman, an astronomer affiliated with Slooh said in a statement. The new app allows an easier, simpler way to use a telescope. Slooh officials are planning on launching an iPhone version of the app later this year, with an Android version due for release in 2014. Since its launch in 2003, members involved with Slooh have taken 1.8 million photos of 46,000 events and objects in the sky from 80 different countries, officials with the space camera have said. You can download the Slooh Space Camera iPad app in the iTunes store.